Summary: What does it mean to do wrong, when no one punishes you? A smart and unflinching look at friendship, the nature of entitlement, and growing up in the heartland. her creative writing class, led by a charismatic new teacher who encourages students to be true to themselves. But who is Paige, if not the homecoming princess everyone expects her to be? In this arresting and witty debut, a girl who was once high-school royalty must face a truth that money and status can't fix, and choose between living the privileged life of a princess, or owning up to her mistakes and giving up everything she once held dear. My Thoughts: Well, this is my first debut read of 2012. Did it start out with a bang? Not quite. We are introduced to Paige who had been exiled to Paris. She is now back from spending the summer babysitting a small baby and is back in her Iowa town. She gets to see her best friends Lacey and Niki. And of course her boyfriend Jake. She's ready for things to go back to normal and spend their senior year becoming princesses, and taking the school by storm. Things are different now though. Lacey is spending a lot of time with Jake and ignoring Paige and Niki is stuck in the middle. And as for Jake, I did not like him one bit. There was just something about him that screamed, JERK! Paige gets stuck in a creative writing class she doesn't really want to do. She would rather be in film with Jake and Lacey. That was the plan for her and Jake to take Creative Writing together because its an easy class but Jake transferred out because Lacey "needs" a friend. In Creative Writing, Paige meets a few new friends. First, there is Shanti. Shanti is a pretty cool girl. She speaks her mind and doesn't take any bull crap from anyone. She doesn't let things get to her either. Than there is Ethan. Cute sweet hugable Ethan. Yep, I liked him from the get go. You could tell her and Paige really got each other, even though she did have a boyfriend and her and Ethan were just friends. I really liked the fact that they were in Iowa. I spent most of my life in Iowa so I knew all the cities they were talking about. I knew Iowa City and all the other small towns! I knew when they talked about Iowa locations, traditions, etc. 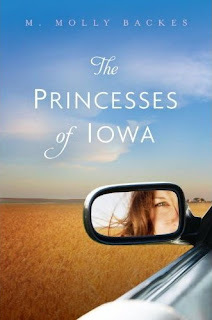 I really wanted to be sucked into The Princesses Of Iowa, I wanted to fall in love with the story, I wanted to be crazy about this one. It just felt really long to me. About 200 pages in, I almost gave up. I felt like it was dragging a long very very slowly. It’s over 450 pages long. I was motivated to finish it though since it was my first debut of 2012 plus it was about Iowa. I left a lot of small details out of this review because I want you to find out for yourself. One example: Why did Paige go to Paris exactly? What is Lacey's problem? Overall: I liked this novel, but didn't love it. It was just ok for me. Maybe you'll like it more than me. All in all, it just felt really long to me and I kept losing interest. It wasn't a bad book and I'm sure some will love it way more than I did. I know I just read too many books to love every single one. Cover: Like the cover! I like the outside and how we can see the girl looking in the rear-view mirror. Very cool. I feel the same way as you did. I liked it but didn't love it. I also did not like how there was so much stuff going on! Too many themes. And I'm still not sure why Lacey was so weird all the time.